Once, there were two Dragons. Two Dragons that were very interlinked with Death. One Dragon was the Dragon of Vengeance, whom made people, who had suffered a loss, grow angry, and seek out revenge to those who had caused them to lose a loved one, or a loved item. Then, there was the Dragon of Honor,This Dragon helped people who had suffered great losses. Helped them be inspired by the dearly departed, and honor the life they head, and celebrate it, rather than mourn it. These two dragons traveled the world, effecting many they came across. Both Dragons were enemy to the other, both with their own goals, to either cause the world to be happy, or angry. Eventually, the Dragons paths crossed, and they fought. They both fought, and both lost. The power used in the battle caused such an explosion that the sea moved, and land was left in the waters place. This land became the Porma Region. 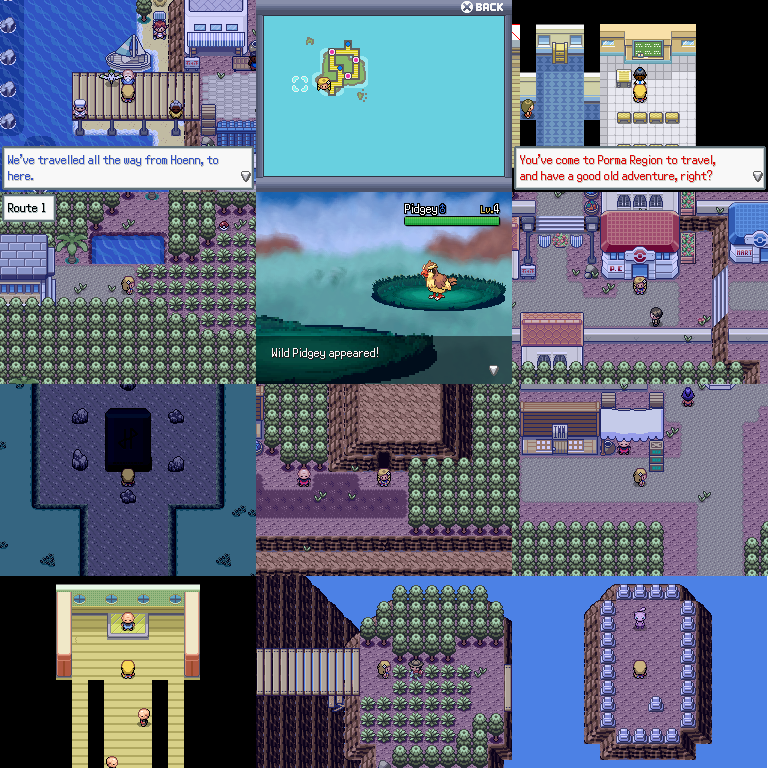 A set of islands in the Sea far south of Hoenn. Humans eventually moved here, and the islands became populated, and the Dragons were worshiped as gods. Many Scholars and Scientists found ancient ruins, beacons that could be lit, and the dragons could return. But, due to the sheer power of such beings, the Region decided it's best that didn't happen. There's no doubt humanity, and Pokémon kind would not survive another Dragon War. Mew = After getting 1st Gym Badge, talk to the Grave outside of Heaven's Tower. Suicune = Mt. Hydra, at the Giant Shrine in the Entrance. Use the Code in the Library to figure it out. The idea is neat, and leaves itself open for a lot of fleshing out lore-wise, but one thing to consider is why exactly people suddenly moved to random islands that appeared out of nowhere, and what significance the dragons brought to this area, when they apparently have traveled far and wide. The mapping looks pretty good, and the aesthetic is very nice. I'm really interested to see where this goes! I'll certainly be following it! 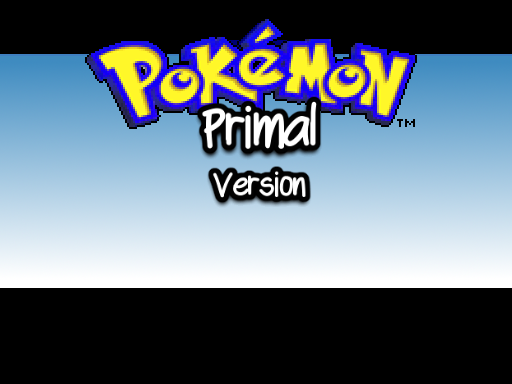 Also, the title screen looks rather boring+ the font isn't consistent pixel wise, so I would adjust that. The first thing of all the story is nothing of the other world, only tells that the region was created in a battle of dragons and that the people went to live there, you do not count anything on the protagonist, the only thing is that in a screenshot says You are going to have an adventure, I would recommend giving a little more importance to the protagonist in the story of the post. I can not say anything else since I have not played it and I can not give you my opinion based on my game experience. Most of it will be explained in game, not in the current Demo though. Humans, and Pokémon migrated over time, not instantly. and the region map is a WIP too, only showing the current island, and is not the final style. There's not that many RSE Graphics in this game, maybe the trees? And, it's only tiles for this island, each island will have a different set of tiles, to make for new, and fresh environments. Those HP bars and battle backdrops do not come with EBS. Might want to add Atomic Reactor to your list of credits. This project looks pretty good, I'm interested to see more of it! I'm quite intrigued by the whole lore you've made up for the islands, I really wanna know what the two dragons were! (I'm guessing Reshiram and Zekrom?) I also like the plan you mentioned to make each of the islands in the region use a different tile set, and I'm guessing have a different theme/climate, I'm excited to see what different tones and atmospheres you set up for each island. It's also nice to you using my gen 3 tile set! I think overall, the mapping is pretty solid, but there's a few areas I think could be improved upon. First of all, I think a lot of your maps look a little too busy. For example, in the sixth map of the town, you have a lot going on, and so the map feels a little cramped. I think you should space everything out a little more, and remove some of the unnecessary details, for example the hanging basket being used as well as the flags, and the wall being so close to the path. I also would change the tile you're using for the main trees. 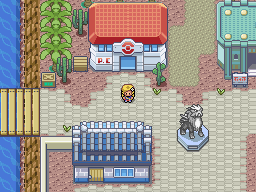 I didn't really intend for the tile to be used that way, and I personally don't think it looks very good to have such a large amount of the particular tile repeated over and over again in the fashion the tree tiles are used in Pokemon games. Maybe try using the larger alpine trees I included in the tileset? Lastly, while I quite like the sky backdrop idea, at the moment the solid blue looks a little bland. I'd recommend adding some clouds or otherwise adding to the backdrop in some way. Overall though, I'd say this project definitely has my attention, and I'm looking forward to seeing more from it and playing it when I have time to! The Two Dragons are not Reshiram, or Zekrom. They're two dragons I've created myself, but don't have sprites for yet. The Maps are going to be improved, and I will probably use a larger variety of trees. As for the sky back drop, it's not all blue, just those two shots are, as you travel a bit more south in the map, there's clouds, and the ocean horizon. Starting work on the next island. 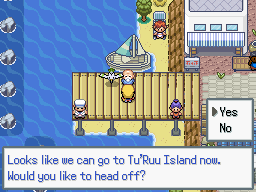 Which will be alot bigger than the first island, and will contain 3 gyms ~!